This blog post contains affiliate links and ads. As an Amazon Associate, I earn from qualifying purchases. The words and opinions expressed in this article are those of the author. Read more info on our Disclosure policy. Are you wondering on what to do in Marrakech? Our visit to Marrakech was short and sweet. Visiting various Marrakech attractions and doing fun activities would take you a week or so to explore! Morocco is a convenient option to escape the winter in Europe and a budget-friendly destination too! 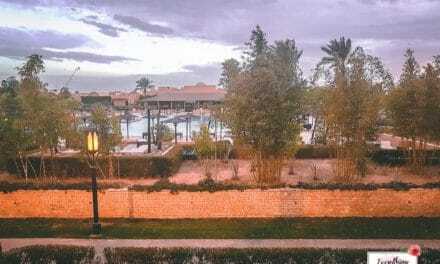 Since our stay in Marrakech was a short getaway, it was made more memorable by the hospitable team of Club Hotel Riu Tikida Palmerie (read my hotel review) as well as the All-inclusive services. Be prepared for a lot of walking, haggling and experiences that will tickle all your senses. The ancient city of Marrakech is located at the foot of the Atlas mountain range in Morocco. Marrakech is known as “the land of God” derived from the Berber word who were the first inhabitants of the city. Here are the things to do in Marrakech that will surely give you a taste of Morocco. Marrakech was founded by the Almoravid desert nomads in the 11th century and used as the capital of a strong empire that they build. 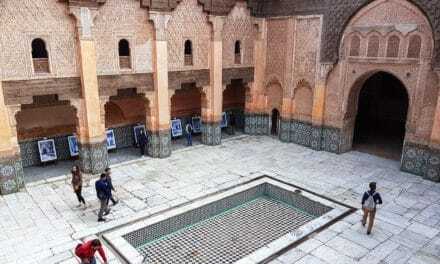 Marrakech is also known as the Red or Rose city because of the reddish-pink colour of the medina walls and other infrastructures in the city that mirrors the tone of the Sahara Desert. You can join various tours around the city like this 3-hour tour around Marrakech and souks. Are you wondering what to do in Marrakech? Hammam is a rejuvenating experience for spa lovers when you visit Marrakech. You will feel like a Moroccan royalty and relax your aching body after walking around the souk all day. You can find a lot of hammam spa dotted around the city with various spa services. It is one of the most popular Marrakech activities that you shouldn’t miss! Try to experience the relaxing vibes of Moroccan Hammam. You can pre-book your hammam treatments here. 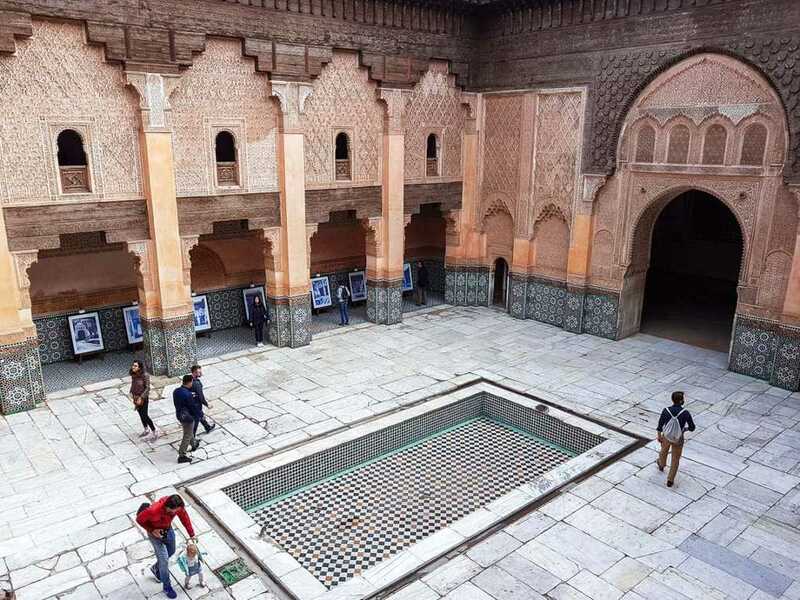 The tile patterns and wood carvings of Ben Youssef Madrasa will hypnotise you to the intricate details of its walls. A Madrasa is an Islamic college. The Ben Youssef Madrasa was named after the founding sultan of the Almoravid empire Ali bin Yusuf. It is also the largest Madrasa in Morocco. You can enjoy the enjoy various Marrakech historical sites by joining this half-day walking tour around the Red city. The beating heart of the Marrakech is the Jemaa El Fna square. Myriad of wandering tourists, blaring vendors and street performers that are vying for your attention and different Moroccan dress and trinkets that will welcome you as you walk around the souks. There are lots of handmade Moroccan lamps, ornate sequined Moroccan dresses, various Moroccan clothing, colourful spices and potpourri, dried nuts and fruits, leathers, pointy styled Moroccan shoes and handmade rugs and carpets. Never miss a bargain when you visit the souks here is a handy shopping guide of Morocco on in getting the real bargain in the medina of Marrakech. Tasty Moroccan food! Have you tried it? #Morocco #Tagine #MoroccanTea I accepted a challenge of #Veganuary so I have to focus more and condition myself to do it. I can do this! Oh! Please don't unfollow me. Haha! Tagine (Tajine) is a popular dish in Morocco. It is a savoury meat stew that is slow cooked in a conical pottery mixed with different spices, fruits and nuts. Other Moroccan dishes to try are couscous, braised lentils, pastille, kefta and piquante. Moroccan mint tea is a traditional hot drink. It is a concoction of green tea with fresh mint leaves and sugar. The mint has a cooling effect that suits well for the warm climate in Morocco. You can join these various food tours and activities to spice up your tastebuds with authentic Moroccan delights! Moroccan fashion revolves around the detailed patterns, glamourous flowing clothing and colourful fabrics. Kaftan is a formal Moroccan traditional dress that has been adapted to various styles in the fashion world. See some tips on what to wear in Morocco. Argan oil is a golden liquid oil from the kernel of Argan tree that is native to Morocco. It has a promise to give you a silky and healthy skin, according to the experts in Argan oil, this is the only beauty product that you will ever need in your life. Oh! It can also be used for cooking. Unfortunately, there are loads of counterfeit Argan oils in and outside of Morocco. The production of Argan oil is mainly produced by the Berber co-operatives near the Atlas mountain. Here are some tips on how you can spot a genuine Argan oil. You can join this day trip to the Atlas Mountain to experience and see the Berber community that genuinely produce Argan Oil. Bahia Palace is admired building in Marrakech. Bahia Palace is located in the medina surrounded by the souks. The Bahia Palace one of the major architectural highlights in Marrakech that depicts the sophisticated beauty and details of Moroccan architecture and design. These are my suggested Marrakech activities and attractions. Here are some other places in Morocco that you would like to consider where they filmed some Game of Thrones scenes. If you have been to Marrakech, let me know other things, experience or places to visit in Marrakech in the comment box below. Our stay in Marrakech was a different experience. It was my first time to visit Africa, and will definitely just the beginning of more African adventures. She is named after a Russian city near Moscow. The Miss Zan-shine of Everything Zany. She likes to travel, history, meet people & try exotic foods! Planning to explore more countries with her D.I.Y trips as a Dual Citizen (British - Filipina). Morocco has been on my mind for so long and I haven’t visited it yet. Being from India, I like the colorful atmosphere all around, the markets, the lamps, the shoes and attires. It’s nice that the hotel hosted you with all the services. It’s a savior at times. I would love to experience India too! 🙂 Yes, Marrakech’s chaos gives so much character to the city. The hotel was handy during our stay, as everything is provided even cocktail drinks. I loved Marrakech when I visited a few years ago. My top things to do were my visit to the Hamman and a walk (or better a few walks) into the Souq. It’s such a beautiful city and I loved the ambience at night time as well, when the city comes even more to life. Yes, totally agree on those recommendation. It is a beautiful city and I would love to go back again and explore more of Marrakech and its surrounding areas and the Atlas mountain. Colorful Shoes, baskets at the souks are good reasons to think of a holiday to Morocco. Mint tea sounds interesting – I assume they make it without milk. Intrigued by Argan oil – what do they use it for? Cooking? Is it very expensive? I love Marrakech souks! 🙂 It was my first time to try the Moroccan mint tea as well and it was delightful, yes, it served without milk. The argan oil is good for cooking and great for your skin. They say that this is the only beauty product you’ll ever need for a healthy glowing skin. Marrakech looks so colourful and pretty! There are a lot of things I can see similar to the UAE (where I live) such as the souks, the clothes and mint tea (I love Moroccan tea by the way, it’s the only kinds I drink) and that’s obviously because we have so many Moroccans here and there is a great similarity in the cultures of the two countries. I would love to visit Morocco sometime, thanks for the suggestions of what to do in Marrakech cause most like I’ll be landing there and will have 1-2 days before I go to other cities. You are most welcome, Medha! 🙂 I absolutely love our visit to Marrakech. I hope to visit the country again soon and like you to head over to other Moroccan cities too! Morocco is such a cool destination in my opinion. All the colors, the flavors, the culture make me want to visit as soon as possible. Oh, and the architecture is also in my interest. I totally agree! 🙂 You should go! Marrakesh really is a wonderful city to escape to in the colder months. I had a wonderful time there but didn’t capture such beautiful photos as yours. What was your favourite thing to do in Marrakesh? I think ours was the hammam. There are many thoughts and confusion about visiting Marrakech. But your post really makes me wanna pack my bags and fly to Marrakech! Great write up, looks like an adventure that you did really well. Souks and Moroccan dress are some beautiful to watch. Bahia Palace with tile courtyard adds to its beauty. And not to forget about the Tagine. Your post brings alive the best of Marrakech so vividly. Oh thank you so much Abdeloihid! 🙂 I hope you’ll get to visit Marrakech soon. Wow! What an incredible place to visit. Honestly, I’d go all the way there just to try the Moroccan mint tea!! It’s definitely worth it! 🙂 Don’t forget to try the Moroccan Tagine too. I love Marrakech and I’m glad you wrote a post about it. I like that many of the building have a spice of red/pink on them. I loved the souks. I vosted souks almost everyday when I visited. I missed Hamman though, but I’ll try it out when I visit again this year. The Moroccan textiles were appreciated souvenirs by my friends, I’m not sure I have anything I bought from Moroccan souks, my friends won’t let me be. I love Marrakech. Thanks for the guide. Welcome Lydia! I would love to go back again. Maybe to explore more of the Marrakech and surrounding areas. Marrakech and Morocco always conjure up these images of exotic bazaars straight out of Arabian Nights kind of a setting. Marrakech is such a colurful and vibrant place and I can see that there is so much to see and experience there. But my favourite activity when I do get there is to explore the colurful Souks, they look so fascinating. True! 🙂 Souks has loads of bargain too. Can’t wait to get to Marrakesh. Would love to see Bahia Palace as well as just walk around taking in the colours, smells, and culture. I might have to bring an extra empty suitcase for gifts by the sounds of it. You will love it, Meg! 🙂 Yes, an extra suitcase will be handy. There are loads of Moroccan bargains in the souks. I have got a taste of Souqs in Sharjah and ever since I have been wanting to explore them more. Morocco seems like an ideal destination for that. Love those shoes which resemble those found in Rajasthan here yet seem different. I am eager to get there at least once. Marrakech seems so picturesque and it definitely has lots to offer, Ryazan. How many days would be enough to explore Marrakech? I loved Bahia Palace. My trip to Marrakech was also short and sweet since I took a daytrip from Casablanca. Wow, Morocco appearances great. Breathtaking round up it’ll be helpful when we’re their next year and great photographs! The Miss ZAN-shine behind this blog. I’m a dual citizen (British – Filipina) living in the UK. I share stories and helpful tips about the best of both worlds.